I tried to print out a scanned angel model. The details are a bit weak given the Makerbot’s resolution. But it makes a nice decoration for the bot. At the MakerFaire two years ago, I saw Bre Pettis demonstrating the first generation of Makerbot. I got fascinated, and since then I’ve always hoped to find a reason to buy one. 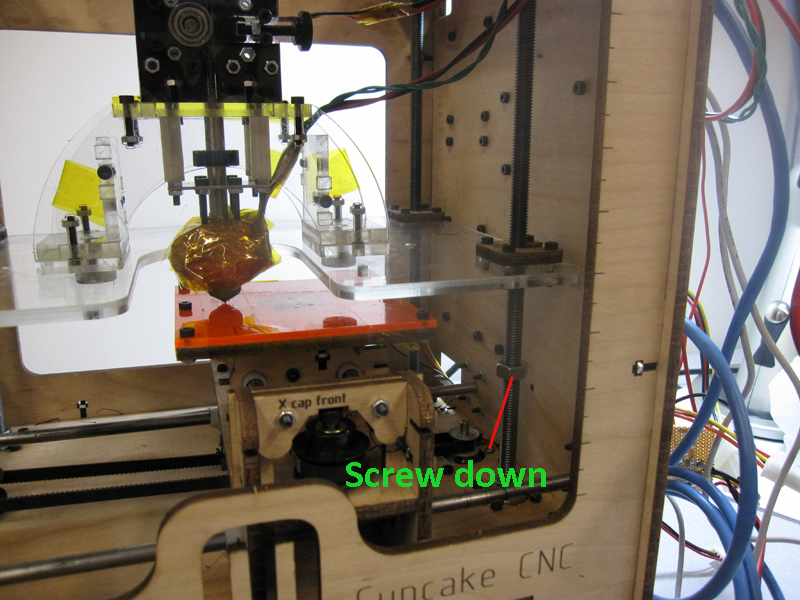 Fortunately, a few weeks ago one of our projects needed 3D printed objects, and we had a chance to place an order of the Cupcake CNC Ultimate kit before it went out of stock. I heard many orders were placed, and we would like to thank Ethan at Makerbot Industry for his great help in assisting us with the ordering. It really looks adorable. Now, that being said, keeping it to running stably turned out to be a quite challenging task, and there were several engineering issues we encountered. I am documenting these issues and the ways we solved them, in case they may help other Makerbot owners. 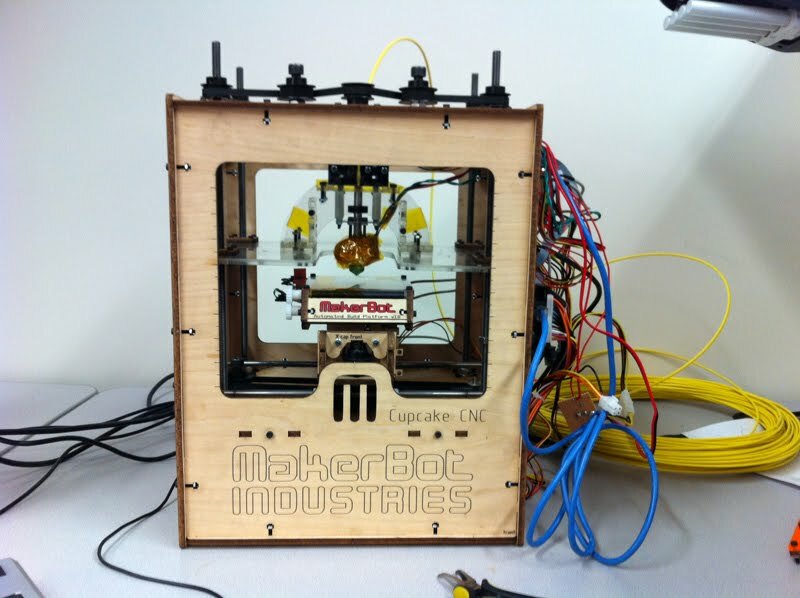 The first issue we encountered was that the extruder motor was not operating properly. Sometimes it would run for a few seconds then stopped rotating. I was very puzzled by this at first, but after looking around for a while, I noticed that when it stops, the motor’s resistance drops to 2.6 ohm, which is way below normal (should be around 45-50 ohm normally). I suspect that it may be due to the motor brush running across a specific point that corresponds to a low resistance state, and normally due to the inertia it would pass that point immediately. But in this case, it seems the h-bridge that is driving the motor is not capable at handling the instant large current, causing the motor to stop eventually. After searching online for a bit, I found the extruder relay fix by rwensley, and we made a simpler version of the fix, assuming that the motor will only move forward and never backward. The fix involved an extra 5V relay, and 2 resistors that serve as voltage dividers to adapt the h-bridge’s 12V to 5V for driving the relay. This has nicely fixed the extruder problem. 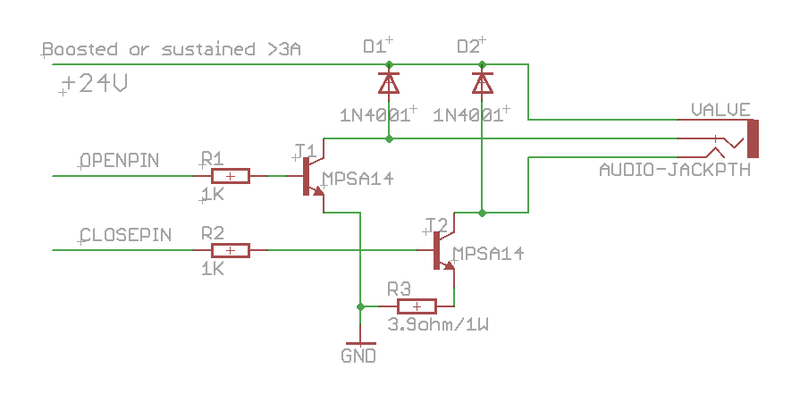 I think a better option should be to use a more powerful h-bridge, or use a separate MOSFET driver. In any case, for now the quick and dirty fix works (see the picture below). 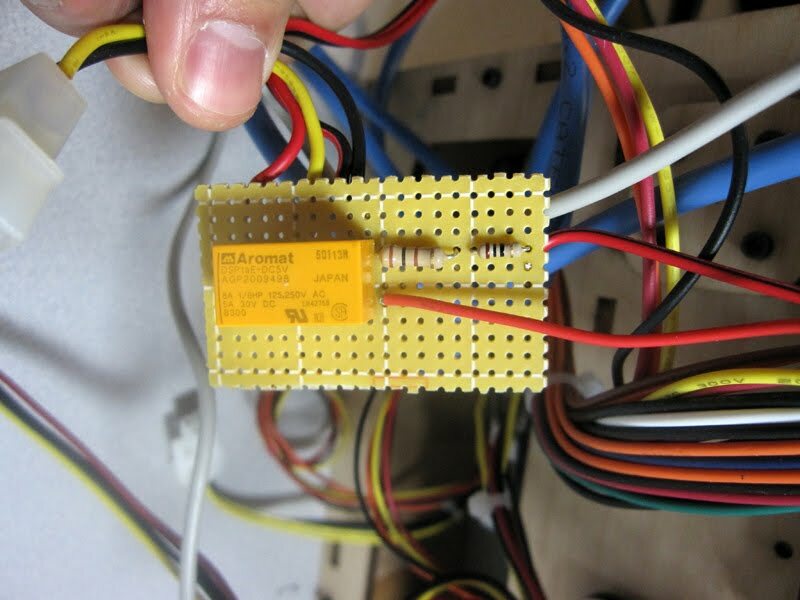 The second issue we encountered was that the heating unit of the automated build platform (abp) did not function — it was simply not turning on the heating power. We thought of many potential causes of it, but none of them was correct. Eventually we noticed that the LED corresponding to the heating unit output never lit up, and this allowed us to quickly nail down the problem to the NIF5003 MOSFET. After testing, we found it’s defective. This came as quite a surprise: a component on the extruder driver board is dead on arrival?! This was a hard find! I didn’t have an NIF5003 replacement, but a quick look at the schematic reveals that this MOSFET is only used to drive a 12V relay, so it should be replaceable by a standard MOSFET like IRF510 (which I have tons of). Once we identified this, the fix was easy. 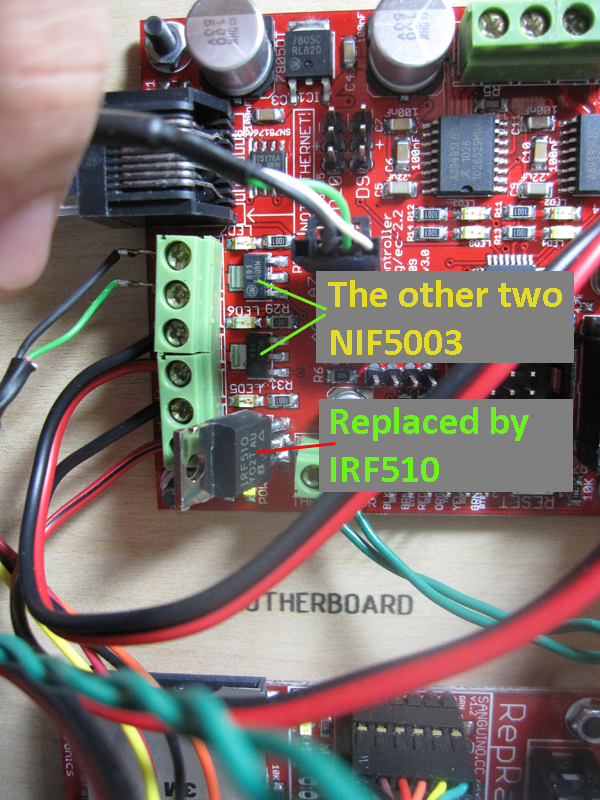 The IRF510 is largely pin compatible with NIF5003 (even though the latter is a SMD component). After replacement as shown in the picture below, the heating unit worked like a charm. The last issue that got really annoying was the z-axis motor making a gigantic noise and skipping steps. We found that this was due to the overly tightened screws and one solution I found online seemed to suggest that one platform screw should be released and ignored just to remove the over-constrained tension force. I was doubtful about this fix, but to our great surprise, this actually worked! No more loud noise and no more z skipping! At this point the device is basically functioning properly. There are still a couple of small issues we need to fix, such as the heated abp not being able to stick the objects onto the platform. But overall we are able to print some nice 3D objects and are enjoying playing with them. So much for our first-time experience with the Makerbot! It has been a while since I updated my blog. Things have been quite crazy the past few months, but now I am back alive writing more blogs sparingly. The first thing I want to share about is an update to my previous post that talked about how to control the Orbit 62035 valve. There have been a couple of missing pieces there which I would like to clarify. First, I found that a MOSFET cannot reliably control that valve. I am not sure why, but it may have to do with the on-state drain to source resistance. But using a MPSA14 (NPN darlington) works, and it requires a base current limiting resistor, so I’ve updated the schematic as below. Second, I was reminded that two kickback protecting diodes are needed to protect the transistor from the inductive current from the solenoid, so those are also added. These are the two main changes. The circuit below has been tested to work. Feel feel to leave comments. Eagle schematic can be downloaded from here.